Last season, record-breaking crowds showed up at many Sierra ski resorts, and the cash registers were really jingling. I thought that this would translate into new chairlifts sprouting up at a number of the resorts. 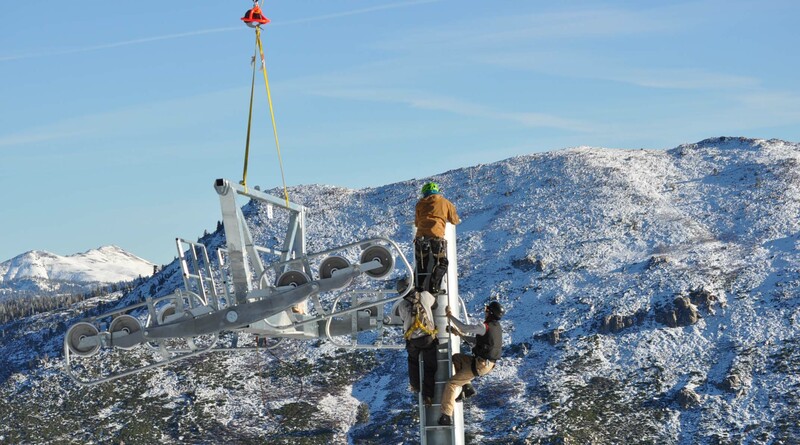 But I can only find one Sierra resort that has built a new chairlift – Bear Valley. Dubbed the Mokelumne “Moke” Express, the six-passenger, high-speed chairlift will do a lot to enhance the skiing and riding experience at Bear. The express runs from mid-mountain to the top in about three minutes and takes guests to most of the 75 or so runs on both the front and backside of the peak. I recall riding some of the earlier slow lifts (Bear has 10) and it seemed like I could almost finish half of a Michael Connelly thriller before I hopped off at the top. The express replaces the old Bear chairlift, which chugged to the top in about nine minutes. Marc Gendron, a spokesman for Bear Valley, said the new chairlift greatly increases the uphill capacity of the mountain’s main artery. So what did the new lift cost to build? Gendron said the financing is included in the roughly $7 million that Skyline Corp, a Canada-based firm, has invested in the resort since it bought Bear Valley three years ago. The “Moke” Express is Bear Valley’s first six-pack chairlift. Because it tops out at 8,500 feet of elevation, the resort typically opens with a slightly later start then the higher Tahoe area resorts. It’s open weekends only in early December and will go into full-time daily operation Dec. 16, weather and snow conditions permitting. Bear Valley prices lift tickets lower than most Sierra resorts. Walk-up, adult, daily tickets range from $74 to $95, depending on the day. The U.S. Forest Service has approved the sale of Bear Valley ski area to Skyline International Development Inc., a large, Toronto-based operator and developer of hospitality resorts and destination communities. The sale price was not disclosed. Skyline intends to press ahead with an ambitious, approved master plan for Bear Valley that includes additional chair lifts, construction of 350 residential units, a new 40,000 square foot village center and a 54-unit lodge. Skyline did not disclose its timeline for making the improvements. Bear Valley was sold by the Bear Valley Mountain Cooperative, a group of community leaders who acquired the resort in 2013. Skyline owns one other ski area, Horseshoe Resort located near Toronto. In its approval action, the Forest Service on December 19 issued a permit to Skyline to operate the resort. Bear Valley, which opened in the Sierra in 1947 between Lake Tahoe and Yosemite Park, has eight chairlifts and one surface lift. With a vertical drop of 1,900 feet spread across 1,680 skiable acres, the resort has 75 runs.